While enjoying a rather entertaining email message from a friend, a question popped into my mind. Would most of these transmissions be forever lost once they were read? How many people save electronic letters that touch their heart or tickle their funny bone? When Beloved and I were courting, we wrote each other letters. This was no easy task for him since dyslexia made putting words on paper quite a chore. Yet, he persevered. Even though he's now in heaven, I can go back and read those letters. Sweet memories make me smile as I think of the kind, loving man I married. Would I still have those notes if they'd been sent via email? I'm not sure. There's something precious about a hand-written letter. A part of the person is embedded in the words, knowing their hands wrote on and physically touched the paper. Perhaps I'm a hopeless romantic, but a letter holds a special place in my heart. I feel the same way about books. The beautiful covers, and the tactile experience of holding an author's work while curled up on a sofa can never be replaced by a computer screen. I love the convenience and fast delivery of email, but I miss opening my mailbox and receiving a note from a friend or loved one. How about you? 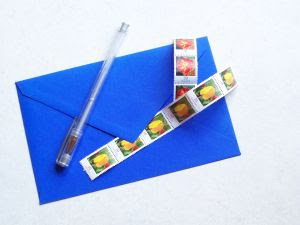 Are you ready to toss the handwritten letter onto the junk pile or do you yearn to keep that personal touch? I'd love to hear your thoughts. Susan, I do not write handwritten letters anymore, but I love to write and send cards and I love to receive cards. When there is a personal written note inside I keep the cards in a box and sometimes I just go through the box and read all the wonderful blessings people have given me. Alwyas encouraging! Thanks for your thoughts, a great post. I agree, Susan. There is something special about a handwritten letter and the written words on a page of a book. The electronic words can easily slip away into nothingness. Emails are deleted. Even if we print them, they're just not the same as seeing the words written in the unique hand-writing of that particular person. I wish I still took the time to write hand-written letters, but it's just so much easier for me to type! How precious is that handwritten note! 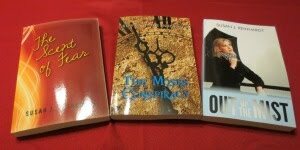 I treasure those written by my family and friends. And save the ones of encouragement and support from other writers. I think it's a wonderful idea to sit down today and write a note to someone we care about. I love the handwritten note, Susan, although I do not do it enough. I have a new friend, an older, unmarried woman, who recently left her Amish roots. She does still cling to some of her old ways, though, and will write me postcards rather than pick up the phone. And she even lives quite close. I cherish those postcards. I love the ease of email and the quickness and I even send ecards now too. But it is nice sometimes to get that mail via the post. I LOVE snail mail. It's just that old shiver of excitement when you open the box and see a fancy, frilly envelope. Sigh. Like e-mails for convenience, tho. And no postage stamp cost! I love getting letters and cards in the e-mail but at the same time I'm not the kind of person who holds onto things for a long time so I guess e-mail works better in that way. Still, there's nothing like a sweet note from someone in the mail to brighten your day. It's sad many of us (including me) no longer have the time to write a meaty letter to our friends. Email has made it possible to reach a lot of people in a fraction of the time. Cards are a nice way to keep that personal touch, especially if they have a short, handwritten note. Can you imagine if the original copies of the Bible were emailed letters? We'd be in serious trouble considering their disposable nature. Like you, I can type so much faster than write by hand. I also miss the beautiful stationery products. While most of my communications are via computer, I do try to write a letter or note when someone needs that personal touch. I'm so thankful for all the letters I have from my husband, my Mom, and others. What a neat story! Perhaps you can glean some ideas for your writing from your friend. When Beloved fought cancer, the cards that decorated his hospital room brought color to an otherwise drab environment. He enjoyed reading them, as well as the notes inside. Perhaps the card is a good bridge between the old and the new. Oh yes, the skyrocketing cost of postage is another reason for the demise of the letter. I, too, love stationery. They often reflect the tastes and personalities of the sender. Sealing wax is fun too, but I wonder if it would gum up the Post Office's machines. LOL! I guess I am sentimental about letters. For speed and efficiency, email works much better. My sentiments exactly! While I love the convenience of the computer, it's not the same. I guess the younger generation won't have those same feelings because the handwritten word is more of a secondary experience. I recall someone on Christian radio wishing they had something in their father's handwriting. They decided to write special letters to each of their own children. As the years go by, these remembrances mean so much. I'm glad you have the letter from your father. While it's so nice to send and/or receive a letter or card, I also love email and find that it's easier to keep in touch because of it. Because of the internet, my kids have maintained relationships that I let slide after HS and college. I do keep emails that bless me. I have folders set up to save emails in categories. And sometimes I print them out for paper folders. I love to get and send cards but I always make sure to writ a long note in them when I do. Nothing worse than getting a card with just a name written in it. You're one of the few people I know who save emails. Even though I'm a big fan of the handwritten letter, it is easier to keep up with people via email. I try to write a short note to personalize a card, but confess I don't do it every time. When I was a teen, I had two penpals - one in Germany and one in England. We wrote for a few years before losing touch. They enriched my life by sharing their customs. With the Internet, we can have many penpals. Yet, something personal is lost in the translation. I have an assortment of pretty thank you cards I like to write out and send whenever the urge strikes. I love handwritten cards! I keep blank notecards and thank-you cards in the house. They don't seem quite as daunting as regular sheets of paper. I totally agree with you! What a blessing to have those hand-written letters from your husband! I saved all the love letters my husband sent when we were dating (we were 850 miles apart). Calling long distance was expensive and couldn't be done every day. Now, we twitter and facebook and instant message and text, and there's very mystery and anticipation anymore. Letters are romantic, for sure. Yes, I'm glad I have them. I don't go through them often, but I know they're available. Our memories can blur with time, but I have a way of refreshing mine. I agree. Letters are much more romantic than Facebook and Twitter. LOL! I can't see myself putting Facebook posts in a pretty box and tying it with a ribbon. Sigh. I hope it's no mystery what She of the Foggy Brain was trying to say. I have sweet signatures from my husband on cards that I've saved. But he's never written me a love letter. That's just not him. And cards are so expensive! I miss the pretty stationery and the time to create homemade cards, though. My mom saves tons of emails. I love the letters from my Compassion child! All the way from Kenya. Knowing that she has touched that paper make them very precious. My late husband saved a lot of emails. I usually save ones I need as a reference. Once I'm finished with it, I throw it out. Interesting point: With the ease of use, we get a lot more emails than we would ever get handwritten. It does present a storage problem.